This region contains some of the oldest places in my world. Construction on Cair Denbar and Imperial City began on the first day I had Minecraft, and has continued since. 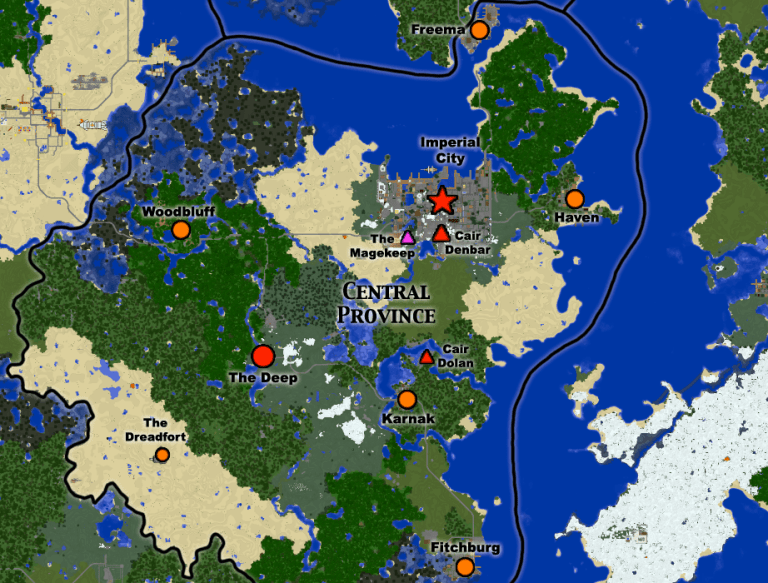 This Province contains two cities, two towns, and three villages. Imperial City is the oldest and largest location I have built. Nearby is The Deep, which is built deep underground into the walls of two converging ravines and inhabited by humans and dwarves. Woodbluff is a tree-top village of wood elves that sits high up in the jungle. The Central Province contains the oldest sections of Denbar and the Empire. Before the Imperial Conquest, it was two separate Provinces: the Royal and Southern. They were combined into one and renamed Central. Imperial City is the largest city in the world, and the Central Province is the hub of the Empire. It contains such wonders as the Cathedral of Light, the Imperial City Skyport, Cair Denbar (the Royal Palace), The Magekeep, and The Great Forge. Denbar is the empire of the Wizards, and this province is their home. It is also home to an underground city of dwarves, and a village of elves. Originally known as the Kingdom of Denbar, it was ruled by the King on High from Cair Denbar – atop its lofty mountaintop. It expanded into the Denbarian Empire when The Deep, Woodbluff, and the Northern City-States joined together along with Denbar.